Wet blasting is commonly known as vapor blasting, slurry blasting and liquid honing. Wet blasting is rapidly becoming the number one choice for applications requiring the highest quality of surface finish. There are numerous reasons why wet blasting is becoming more favourable over dry blasting and this is primarily because of it’s two key features; firstly, the finish is achieved by flow of water borne abrasive – not by impact, and secondly because it is a dust free process. Wet blasting is a less aggressive form of blasting in comparison to dry blasting, working just as effectively. 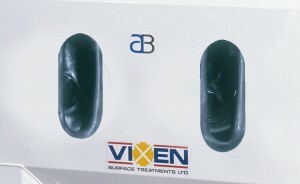 The ricochet of media is reduced due to the cushioning effect created from the water acting as a lubricant between the media and the component surface. As a result, the angle of the media is changed, producing a lapping effect travelling across the surface, resulting in an even satin/ polished finish. The illustrations below show the different processes of grit, bead and wetblasting. Unlike dry blasting where the finish is produced by sheer force of media impact, wetblasting does not allow for media to be impregnated into the component, nor is there any dust created by the break-up of media. In the UK, ‘SMART’ alloy wheel repair specialists have taken full advantage of its dust free process, as it means numerous tasks can be carried out simultaneously without the worry of dust spreading and impacting other areas of work. One of the main benefits of using a wetblasting process is that the media/ slurry can be recycled. A specially designed glandless polyurethane pump agitates water and media into a slurry and pumps it to the blast gun. In order to accelerate the slurry to provide an excellent cleaning effect, compressed air is added at the blast nozzle. Once contact has been made between the slurry and the component, the slurry is drained back into the sump creating a recirculating system. Broken down media is fed via an overflow to a sedimentation filter located at the rear of the cabinet. Internal cabinet walls above the floor height are bonded in rubber for noise suppression and to avoid wear to the stainless steel. Pump or air agitations for media delivery/slurry mixing. The pump is a moulded polyurethane unit which is non corrosive and resistant to abrasion from the media slurry. Compressed air to accelerate the slurry. 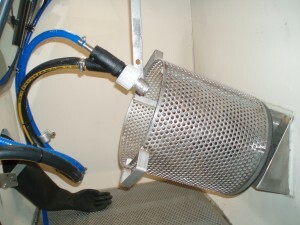 The Aquablast machine requires a compressed air supply to operate. The compressed air requirement depends on the blast gun nozzle size and the pressure required to clean effectively. Increasing the air pressure greater than 60psi (4.5 bar) generates more vapor and as a result, visibility is impaired. *Component parts will wear in time and require replacement, however the first component to wear is the hardened steel air jet. This is located or held in the correct position using the grub screw. Rotation of the air jet periodically will extend the life of this. A reinforced steel fabricated door with full depth and height access is situated to the left hand side of the cabinet. 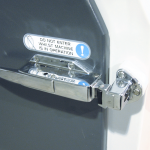 Air cushioned seals are fitted and the door is secured by a quality chrome slam shut door handle. 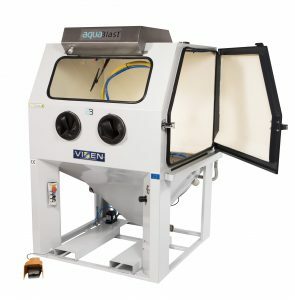 Vapor blasting using a closed loop system is one of Vixens most popular choices, as the machine does not need to be connected to water or a drainage system. The purpose of the sedimentation filter is to separate solid particles from the water coming out of the overflow. The electrically operated solenoid value stops, creating a delay, which allows for the abrasives to settle in the machine hopper. Following this, the value opens and allows the over filling of water to exit via the overflow tube to the sedimentation filter. The closed loop system has a paper filter which collects the debris. This needs pulling through manually when it becomes too contaminated. 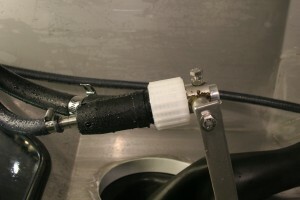 A 12 volt pump is fitted to the base of the sedimentation filter which supplies relatively clean water to the rinse gun. 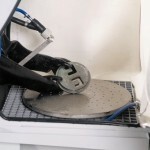 The hydro cyclone is ideal when it comes to emptying the machine or changing abrasives, as it is designed to separate water from the blasting media to around 90-95%. This leaves a balance of water which can go down a foul drain. For small components the tumbler barrel, which is fitted to the cabinet door, will be used. This gently tumbles small components (e.g. nuts and bolts) whilst they are simultaneously blasted. The base of the tumbler barrel is perforated allowing the slurry to exit the barrel and recycle via the machine sump. 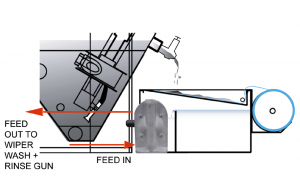 A gun holder will be fixed inside the machine for the tumbler barrel. Heavy objects can be difficult to manoeuvre inside the blast chamber without opening the door. Machines are available with different turntable options, which allow the operator to move the components without the need to stop blasting. Option C – Stainless steel turntable complete with stainless steel trolley and mild steel roll out track 1.2m with drip pan. For some applications where manoeuvrability within the blast chamber is required, bellow type arm hole ports are recommended. These offer the operator easy access to high components or where mobile turntable, for instance, are used. Regular gauntlets attach easily to the bellows for economic replacements. Fitted inside the cabinet is a blast gun holder, enabling the operator to present the components to the blast nozzle.